WAIST HIGH: Ska'd For Life. By the time he was fifteen, Horace Panter was the proud owner of a Rosetti Bass 8 guitar. He couldn't play it, or even tune it, but he could stand in front of his bedroom mirror in sleepy Kettering and imagine himself on stage, a denim-clad long-haired rock god playing to an adoring crowd. Ten years later and the dream came true - kind of. As bass player with The Specials, in his second-hand suit and pork pie hat, Horace was a member of one of the most innovative and exciting bands to come snarling out of the punk era. Founded by Jerry Dammers, their fusion of punk, reggae and ska created a new musical fashion, spearheaded by their own record label "Two Tone." They stood for unity and racial harmony in a polarised society. They even got British men dancing again for the first time in fifteen years. 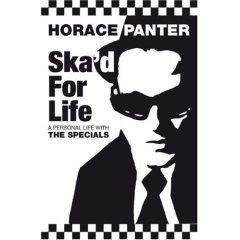 In Ska'd for Life, Horace takes the reader on a musical odyssey with The Specials from their early days on Coventry's punk circuit to chart storming success with singles like "Too Much Too Young" and the eerily prescient "Ghost Town," released as the race riots of 1982 saw Toxteth and Brixton go up in flames. Horace had achieved his childhood dream, and seen it disintegrate along with the band. Written with wry humour, taking an affectionate look at a band whose sublime music remains influential today, this is a must for all Specials fans and for anyone who's ever dreamed of being a rock star. Ska'd for Life: A Personal Life With The Specials will be released in July 2007.